Sit back, relax and enjoy the magnificent view on your private balcony overlooking the Gulf of Mexico. You also have an equally incredible view of Mobile Bay from the front side of the condo. Free wireless internet access. 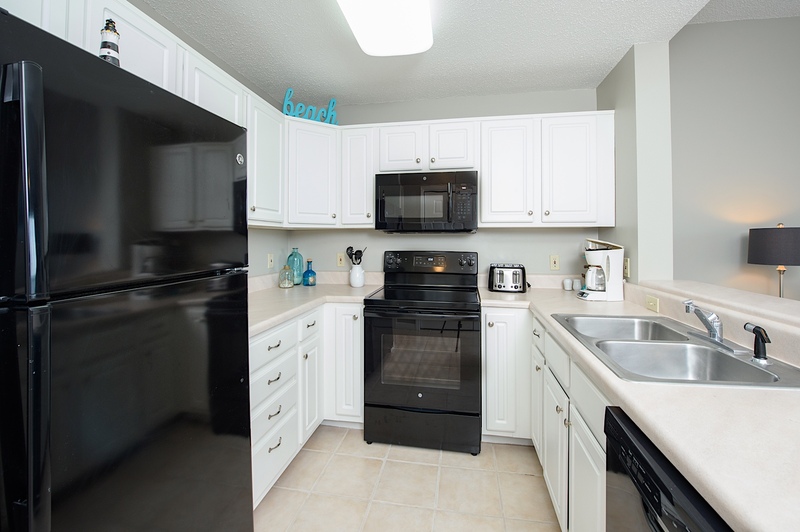 Our condo has a fully equipped kitchen, comfortable living/dining area and a full size washer and dryer. The master bedroom has a king size bed with a private bath. We have multiple TV's, DVD and a stereo system with a CD player. 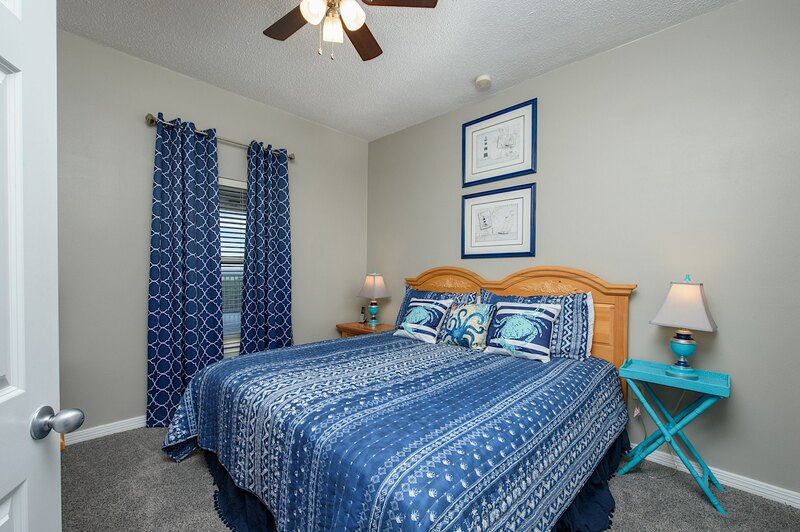 Enjoy your stay with all the comforts from home in this top floor unit!! Come on down to the most beautiful beaches and incredible sunsets you will ever see. Take a trip just a mile and a half down the road or the beach to visit Fort Morgan or take a trip in to the heart of Gulf Shores and enjoy some of the many activities our beautiful town has to offer. "This was our second year in a row with Sunset Properties, we will be shortly booking for our third. We stayed at The Dunes again and we can't say enough good things about it. We brought our family dog Mavis again and she calls this her home away from home. 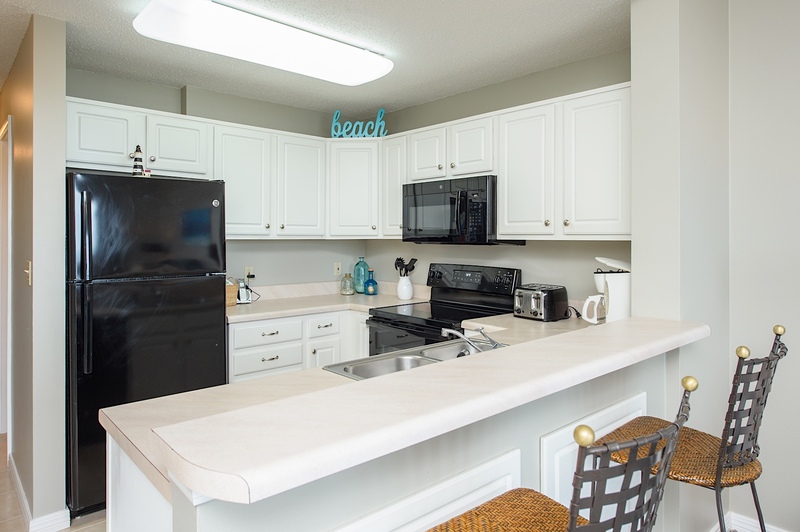 The beach is beautiful, so much to explore, and the condos are equipped with everything you need. Just bring your swimsuits, some groceries, and some dog treats and your all set. Sunset Properties is super fast and easy to book with too. I was on the phone less than five minutes! See you next year! !🌸🌴🐠"
"Yay!! We look forward to booking your next stay and to show our appreciation for our repeat guests, we offer a discount! Just make sure you let us know this is your third stay with us. We look forward to having your family, Mavis included, back next year!" "Nice condo, clean, great AC! We had no problems other than the master bedroom window had no blackout curtains so it let in light from the outside walkway." "Yay! I am so glad y'all had a good stay and enjoyed the condo. The curtains, as everything else in the condo, are picked by the owner, we're sorry you didn't like them. We would love to have you back!" "Good location away from the busy downtown area. 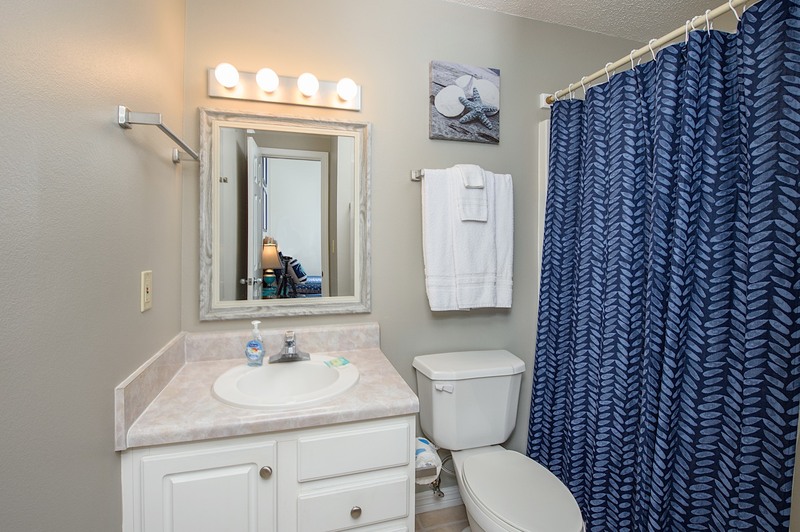 Place was clean and well prepared." "Max, thanks for leaving a review. I'm glad you loved the peaceful area of Fort Morgan. We hope to have you back!" "Nice but not alt around"
"Everyone we met and interacted with were great!,the only complaint we had was the location ( too far from town)"
"We are so glad that you enjoyed your stay with us! We do try to inform our guests of the distance from town when they book with us. Most of our guests love the seclusion at Fort Morgan. We hope you will book with us again for your next trip!" "We would book this again in a heartbeat. The condo was clean and the views were wonderful. A little walk to the beach, but not bad at all. We hope to book again next fall. " "Justin, we were so glad to have you and happy to hear you enjoyed your stay! Get that next trip booked!" "This place is nice, clean and allows your fur baby. It is off the beaten path so if you really want to relax, this is the place for you. The only downside is the walk to the beach is a little far if you have things to carry. I suggest bringing a wagon to carry things back and forth especially if you have children. I would definitely book this place again!" "Whoop! Thank you, Tara! So glad that you discovered our little piece of heaven!! We will be glad to have you back!" "This condo was perfect for our girls' retreat! It was refreshingly clean and spacious enough for our party of three. Fort Morgan was a great choice as it was not crowded and had the feel of a private beach. I would stay here again, but I would bring a wagon to haul items to and from the beach. The walk wasn't too long, but it would have been more enjoyable with a lighter load! Also, the balcony was directly above the pool. While it didn't bother us, some people may not want to hear the pool "excitement". The management was wonderful! All in all, it was a great experience!" "So glad you had a good experience, we appreciate you taking time to write a review for us! Hope you all can do this again!" "We had a great stay at Dunes 705. The unit was perfect for the size of our family-2 adults & 2 small kids. The kids loved the bunk beds! Everything was clean and working. The kitchen was well stocked. The short walk to the beach wasn't a big deal. Our kids loved the pool too. We loved the view from the top floor of the building! Sunset Properties was great to rent from and they were so helpful. Customer service was 100%! We will definitely be renting again!! " "Thank you, Jennifer! So very glad you enjoyed your stay, we were glad to have you!" "Quiet area. Close to Fort Morgan and Dauphin Island ferry. Clean complex. Nice pool. " "Great! We're always glad to hear you enjoyed your stay!" "Our experience was great even though some of the patio furniture was a little worn and not the most comfortable. My family really enjoyed our stay. The condo is beautiful and the beach views are gorgeous even though it's a little farther away than we expected,but the road and boardwalk made it much easier. Watching dolphins and big ships was amazing. Loved the quietness on the beach. Thank you for a fabulous stay!!!" "Whoop Whoop!! That's what we love to hear! SO very glad you enjoyed your stay! " "Perfect size for my 80 year old parents to stay at for their first beach vacation. only problem was they could not get direct tv in the bedroom, which is where they usually watch tv to help them get to sleep at night. that was unfortunate. 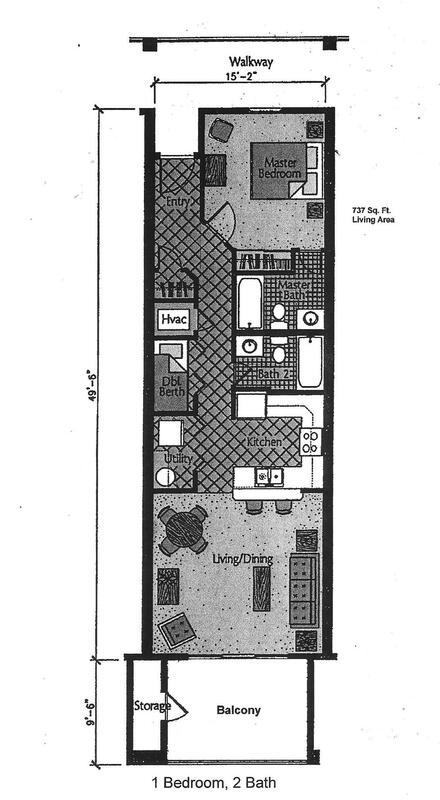 condo could use updating, such as paint (chips on walls), better appliances in kitchen, etc. " "We are so sorry you had an issue with your tv, we certainly would have taken care of that if we had been notified. We are so glad that was the only problem you had, the weather has been perfect!" My lady and I are from south Louisiana, were in our 50's, and prefer our vacation to be quiet,peacefull, the opposit of the Bar Seen. 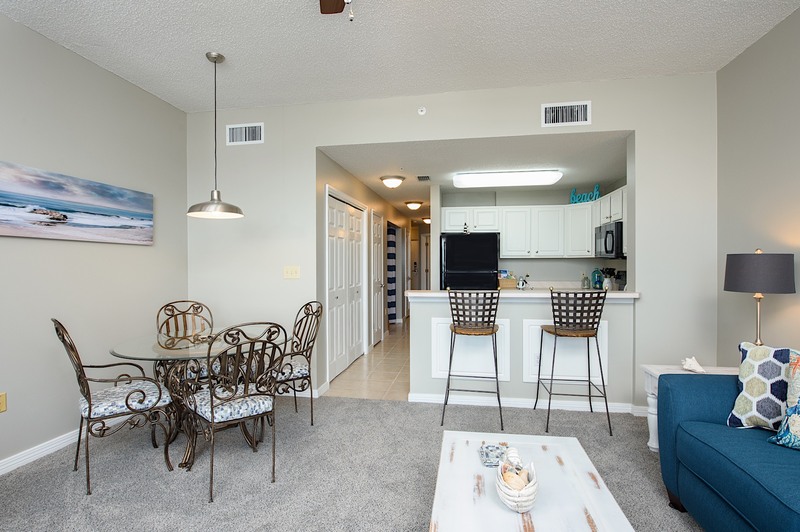 The pet friendly one bedroom condo, Dunes 705 was everything we were expecting and more. It was waiting for us when we arived, was clean and inviting. Very friendly Nabors that respected our loner attitude. Great view of the beach also. We spent most of our time walking along the quit beach,exploring Fort Morgan that was only minuets down the road,and don't forget about the ferry ride on y'all way in,our leaving out. It's a wonderful way to start or end your trip, plus it saved us about a hour travel time. Just check and be sure it's opporating befour you venture off the interstate, may save you some back tracking time. We will be going back next year and recommend it to anyone that prefers the quiet side of a beach vacation,( not the loud parting bar seen ). Thank y'all for making our stay everything we were expecting and more, and we will see y'all next year, for sure !!!" "Thank you, Thank you and,,, Thank you for such a thorough review! This is so helpful for those who are trying to understand our area. We can't wait until you visit again!" "This was the first time that we stayed at The Dunes! We had an amazing experience while we were there! They were very accommodating (we brought our jet ski and were able to keep it there). They were very friendly. The condo had a wonderful view of the ocean!! I highly recommend The Dunes. " "We have stayed with Sunset Properties many times and this trip was no different from the rest - wonderful." "Thanks so much for the compliment! We love our repeaters too!! " 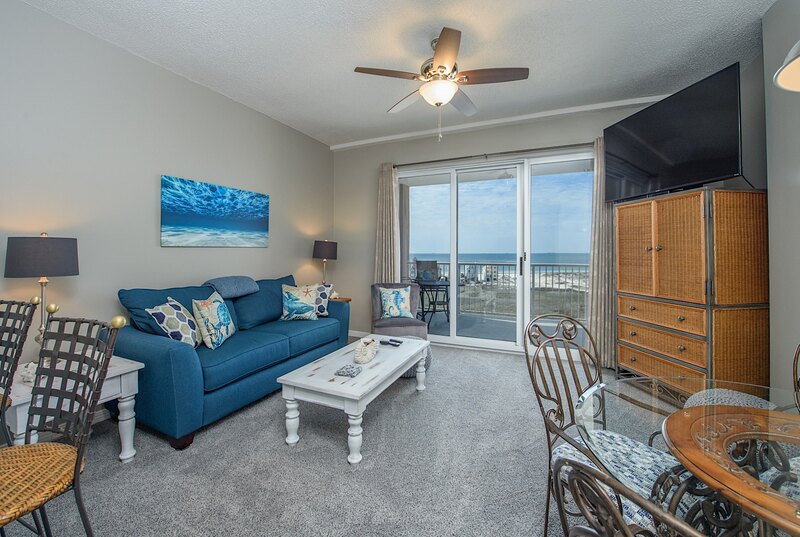 " Clean, spectacular view, great into the beach that seems very secluded from the hustle and bustle of the Gulf Shores area. Well-maintained and clean nice bright colors in the condo. The people were spectacular to work with and super nice. We will definitely stay here again ." "We had a fabulous time loved our view from 705 not a bad walk to the beach and staff was very friendly. Would definitely book again it is a drive to orange beach but it's nice to be away from the big crowds! " "My family and I had a great time! 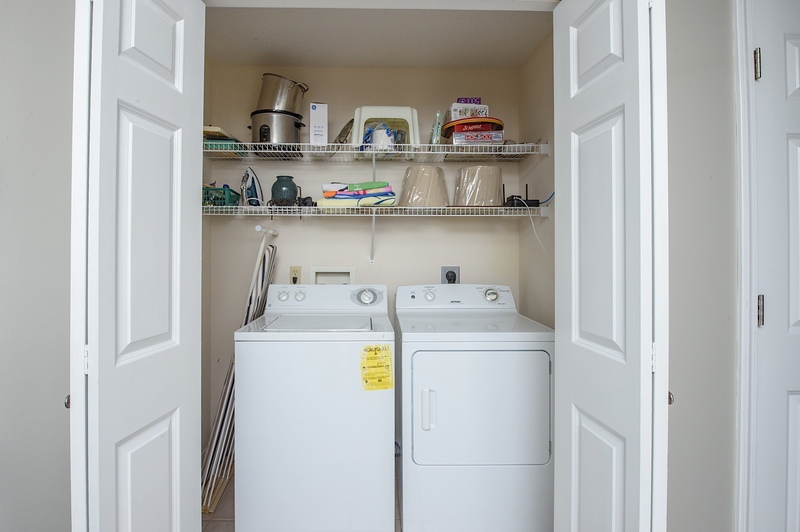 The condo was clean and I was very appreciative to have a washer and dryer. The beach was quiet and not crowded at all. The staff was very friendly and helpful. Overall a nice vacation! " "Thanks for the review! " "the room was just as described. The bedroom had its own bath and TV. It rained most of the time and my 5yo watched cartoons all day. Great views; close to places to go and see"
"This place was awesome but three complaints.. the front door key system is cumbersome and when windy very very difficult to operate, please install weatherstripping on your front door.. the wind was howling off the Gulf/Bay for two nights and whistling very loudly I'm sure this is fairly common considering your location by the water and please get a portable handicapped lift for your pool . Its a terrific pool but my fiancee is paraplegic and could use it because you have no lift. All major hotel chains have them as a courtesy to their guests Thanks.. You have a great place otherwise . Only submitting complaints to enhance the next experience "
"Making reservations was quick and easy. The unit was very nice and clean. The beds were comfortable, and we liked the carpet in the living room. We were disappointed to find the hot tub was closed, but we survived. We've stayed in Fort Morgan 3 times this year, and it's never a disappointment. " "Thank you for your review of your stay in Dunes 705. Sunset Properties strives to make every aspect of the rental process smooth and enjoyable and we love when our guests come back over and over. Unfortunately the heater had gone out on the hot tub while you were here but is now working so come back soon so you can enjoy it again! Sunset Properties Staff"
"Nice condo great view I wish it was closer to beach had to dry"
"Thank you for taking time to write a review of your stay in Dunes condo 705. Glad that you and your fur baby enjoyed our beautiful little paradise. We look forward to booking your next stay with us soon! Sunset Properties Staff"
"Thank you for taking time to review your stay with us in dunes 705 condo. Glad that your stay was relaxing and quiet. We look forward to booking your next stay with us soon! Sunset Properties Staff"
"Loved the condo and the location! The beach was beautiful and the short walk was nice. The dogs loved the beach and the condo! We were very happy with everything and will stay here again! " "This condo was in a good location and the patio was one of the larger ones that we have seen with seating for six. The staff was also friendly. The furniture and and furnishings, in the condo are a bit outdated but that was understandable in a dog friendly condo. The view of the ocean is great but it is a bit of a walk. You can drive down and park though. The marina view is nice while you are waiting on the elevator. Everything was in working order and was well stocked." "We loved the condo. It was perfect for our family of 4. However, we quickly realized that the dishes had been put in the cabinets dirty. I had to rewash everything the first day. The soap compartment on the dishwasher is broken and will not close so the only efficient way to wash the dishes and get them clean is by hand. " "We had a few problems & Sunset properties took care of them immediately! Very impressed with their service! The kitchen in this particular condo was very much lacking: chipped dishes, inadequate number of glasses & other dishes, non-working appliances... I could go on but you get the idea. I have stayed at Sunset properties condos & houses many times & this was the most poorly appointed kitchen we've ever experienced. That is my only compliant; overall, it was great! Wonderful staff & absolutely beautiful! " "Thank you for taking time to write a review of your stay in Dunes condo 705. So sorry that you had issues while you were here, we will make sure these things are addressed ASAP. This time of year is when we Deep Clean the units , take inventory of everything and replace anything broken or missing. Truly sorry that the condo was missing so many items when you were here but we had a very busy summer and lots of guests in that unit so it was very well used. We do hope you will continue to return to Sunset Properties for your beach vacations. Call or visit us on line soon to book your next stay! 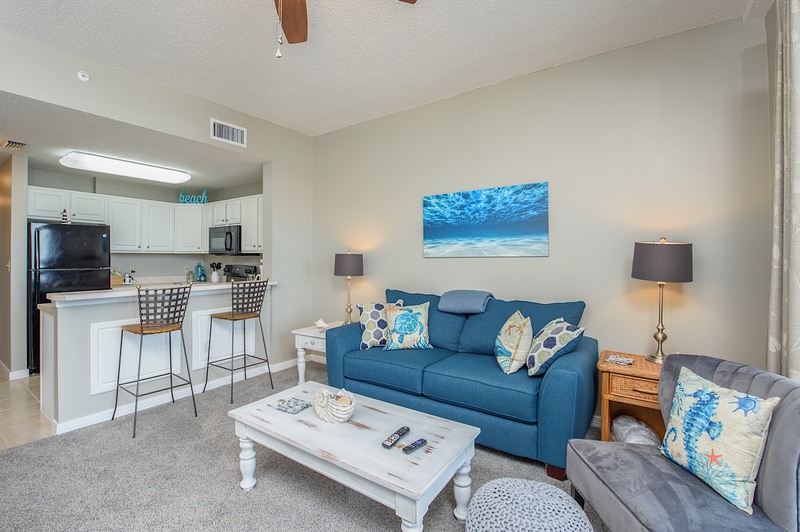 Sincerely, Sunset Properties Staff"
"Truly enjoyed our stay in 705 at the Dunes in Ft Morgan...great condo, beautiful view, everything you need except groceries in the unit...bring some dishwasher liquid, clothes detergent and a roll of garbage bags, it's helpful. Gorgeous beaches wonderful pool and a nice hot tub. It is quiet, kinda has that secluded feeling. We loved taking the ferry to Dauphin Island, toured the Fort and enjoyed hanging out at the ONE bar at that end of the island Tacky Jacks! If you want quiet kinda low key this is your place...and town is just 18 miles east if not...we will be back!" "Thank you for taking time to write a review of your stay in Dunes Condo 705. So glad to hear that everything was enjoyable during your stay in our little hidden paradise. Don't you love the peaceful, quiet, secluded feeling that Fort Morgan offers? Touring the Fort is such fun and the Ferry ride is truly a wonderful experience too! We look forward to booking your next stay with us soon! Sincerely, Sunset Properties Staff"
"Excellent! The Dunes was very nice and in a peaceful and beautiful area.The gulf and bay views were fantastic and the beach was pristine. The condo was very nice.We would defi Itely come back again. Great vacation! " "We had a great time. I am looking forward to the next vacation." 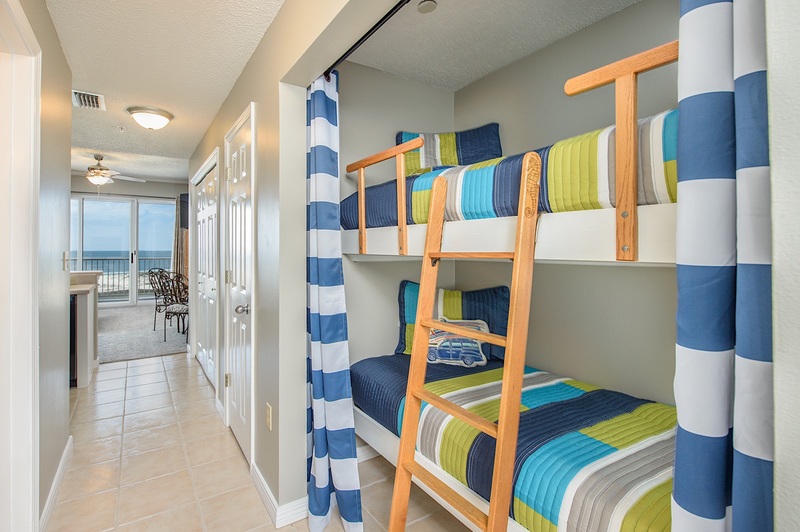 "My wife and I and our two kids stayed at the Dunes for the third time and are overall happy. this condo had almost everything we needed, WiFi was great, direct TV and nice furnitures. The kitchen tools was not the best in the World but we managed it. would like to see better a better ourside area for grilling and access to the indians pool. Will for sure come back. Last night we went to dine across the street - Don't do it!!! " "Thank you for taking time to write a review of your stay at Dunes condo #705. We love hearing that you are repeat means we are doing our job of providing the best vacation rentals for our guests and that they want to come back time after time. We are sorry to hear that the kitchen tools were not quite what you wanted, we will inventory and and make sure we stock the kitchen with everything needed. As for the outside grilling area under the pavillion, we try to make it as user friendly for our guest as possible. The use of the pool at the Indies is not an issue we can solve, that building is managed by another company and their pool is only for their guest. You can, however, use the pool in the neighborhood, it is shared by houses and Dunes condo guests. Please call us or go online to book your next visit with us soon! Sincerely, Sunset Properties Staff"
"wE surprised some relatives staying in a beach home with our visit. The condo was perfect for what we were looking for. would stay in same unit again. sunset did a great job securing us perfect weather ! " "We are so glad to hear your surprise visit was everything you hoped. We strive to make sure every stay with Sunset Properties is perfect from the weather to the clean, comfortable condo. Call us soon to book your next visit. Sincerely, Sunset Properties Staff"
"I really enjoyed the vacation. You made it convenient to load and unload my car with luggage and groceries with the carts provided in the front entrance. If there is any complaint I would say that the elevator need to be air conditioned or cooler in some way. If someone would get trapped in the elevator it would be a definite death trap. Other than that I enjoyed the stay. " "Thank you for taking the time to review this property and your stay. We are so glad you enjoyed your stay and we look forward to seeing you back again very soon! Sincerely, The Sunset Properties Staff"
"Only problem was a large group of boys that were loud and rowdy in pool and drive everyone else out. The sign said the area was monitored at all times so i think this should have been corrected immediately. " "Thank you for taking the time to review this property and your trip. We are sorry you ran into issues enjoying the pool at the Dunes. When you stay with us in the future please give us a call the number for emergencies and problems posted by the pool if you ever run in to this issue. We look forward to seeing you again in the future. Sincerely, The Sunset Property Staff"
"Very enjoyable. Quite and peaceful." "We are so glad to hear you had a wonderful time on your vacation! This condo has a beautiful view that you can get in very many places. Thank you for taking the time to review this property and we look forward to seeing you again in the very near future. Sincerely, The Sunset Properties Staff "
"A wonderful , wonderful time had by all. One of the best run rentals ever. The staff could not have been nicer. The condo was just as the pictures show. We will be back. " "It is always fun to see dogs on the beach! We bring our dog and this is a very pet friendly resort. The beach is beautiful. " "We always look forward to staying at the Dunes. It always feels like home and we are always treated like family by Sunset Properties. We are already planning another trip for mid September!" "Overall trip was very good. Many things to do in the area. Weather was cool the week we were there and unfortunately the pool was not heated. Kids were a bit disappointed but found plenty of other things to keep them busy. Would stay here again!" 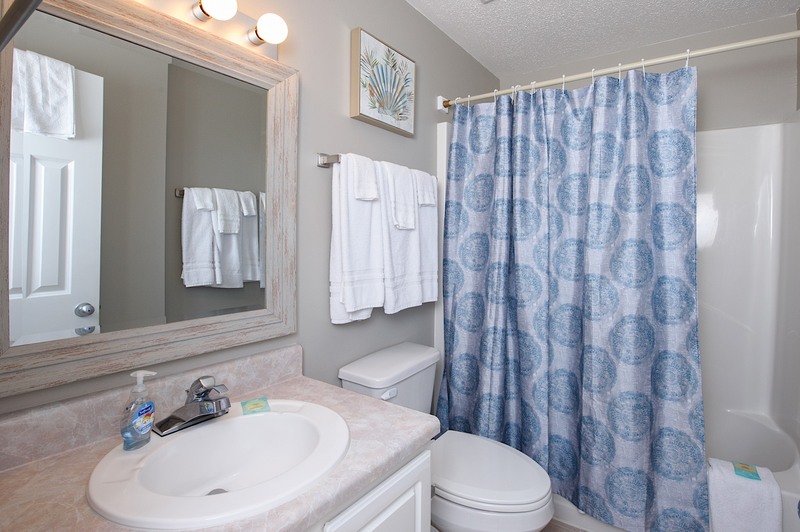 "Unit was very comfortable and well kept. Overall a very good value. We did not know that the pool was closed for work until we went to our room. You should let guest know in advance. "